Large South Haven Michigan luxury rental home near North side beaches, with pool access- sleeps 12 guests and is perfect for family travel. Game Room, firepit, fireplaces, all amenities, and garage included. Front view- New construction will be similar in design & color Kitchen- new construction will have similar finish levels Open concept dining room- new construction will have similar finish levels King master bedroom- new construction will have similar finish levels Living Room- new construction will have similar finish levels Stairwell- new construction will have similar finish levels Master Bathroom- new construction will have similar finish levels Queen bedroom- new construction will have similar finish levels Twin bedroom- new construction will have similar finish levels Bathroom- new construction will have similar finish levels Bathroom- new construction will have similar finish levels The cottage is stocked with fresh linens, towels, and pool towels- the home also has a full laundry room. A spacious two car garage is attached. Driveway and free street parking are also available. Access to the Private Marina, Clubhouse, and gated Community Pool are included. The Harbor Club South Haven Resort is located on preserved wetlands and woodlands and includes a quaint pond and private marina. Harbor View- a river bluff cottage for up to 12 guests! 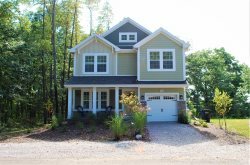 This large, brand new cottage with completed lower level is a spacious 3,060sf. It has 6 bedrooms, 4 baths and is finished in a warm and relaxed décor with an open concept floor plan that’s perfect for getting a large group together. It features comfortable, quality furnishings, a gas fireplace, a fully equipped kitchen with stainless appliances and an outdoor gas grill and patio furniture. It also has Comcast tv and WIFI, DVD players, front and back porch, central air, washer/dryer and plenty of linens. There is a first floor bedroom suite with queen poster bed, TV, and full bathroom. Upstairs there are 2 king bedrooms and 2 guest rooms with 2 twin beds and 1 trundle bed in each. The basement includings an electric fireplace, pull out sofa, large screen TV, a sixth bedroom and full bathroom. The flexible lay out allows the home to sleep up to 12 guests. The home is perfectly equipped for large families or groups of couples! Located in the Harbor Club of South Haven Resort & Marina, the cottage includes access to the Woodland Harbor Marina, Resort club house and outdoor heated pool. The closest beach is a small public beach. It is just a 15 minute walk away and a little more secluded than the busy primary beaches. The Resort community is about 1 mile from downtown South Haven. All towels, linens, paper products, and a starter kit of soaps are included in the cottage. Guests receive access to the resort's marina, clubhouse, community pool, and fire-pits. Boat, golf cart, beach cart, and bicycle rentals are all available. Check-in is at 4pm EST- if housekeeping is able to prepare the home sooner we will make every effort to contact guests and allow an early check-in. Check-ins take place at our Welcome Center Office in the Harbor Club South Haven Resort (330 Ash Street, South Haven MI). At least a 50% deposit is required at the time of booking, guests have until 30 days prior to check-in to pay the remaining balance. Discounts may be offered for guests reserving multiple cottages- please contact our reservationist at 269-906-9490 for details!